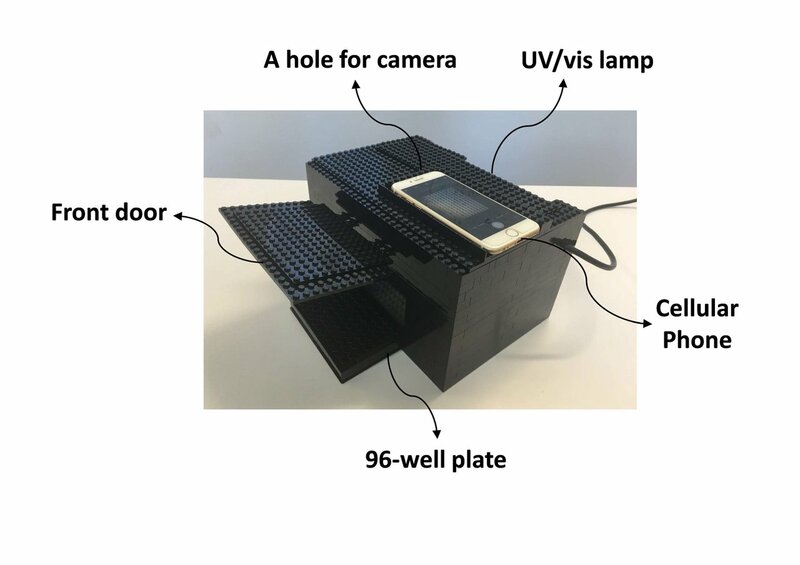 Researchers at The University of Texas at Austin have designed a way to sense dangerous chemicals using, in part, a simple rig consisting of a smartphone and a box made from Lego bricks, which could help first responders and scientists in the field identify deadly and difficult-to-detect nerve agents such as VX and sarin. The new methodology described in a paper published Wednesday in the open-access journal ACS Central Science combines a chemical sensor with photography to detect and identify different nerve agents—odorless, tasteless chemical weapons that can cause severe illness and death, sometimes within minutes. Eric Anslyn, a chemistry professor at UT Austin, has been studying nerve agents for nearly 20 years, using safe chemical compounds that behave in the same way as nerve agents and can mimic them in testing. He previously developed chemical compounds that neutralize nerve agents and at the same time create a glow bright enough to be seen with the naked eye. "Chemical weapons are dangerous threats to humanity," Anslyn said. "Detection and neutralization are key to saving lives." 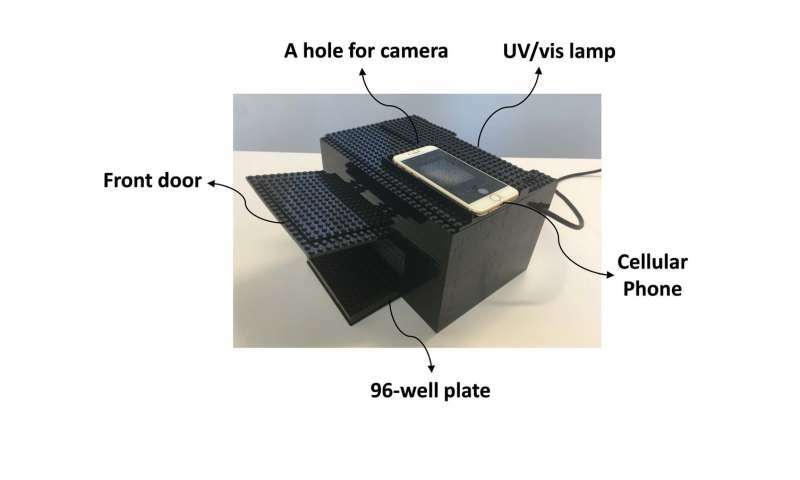 The new device uses affordable, accessible materials to make Anslyn's earlier compound more useful in real-world scenarios. The chemical sensors, developed by Xiaolong Sun in Anslyn's lab, generate fluorescence, which is key to the analysis. Different colors and brightness can signal to first responders which of several nerve agents are present and how much. Because different categories of nerve agents require different decontamination procedures and different treatments for victims—and because the weapons act swiftly, making time of the essence—these variations are key. "Unfortunately, it can be difficult to see differences in the level of florescence with the naked eye in the field. And instruments used in the lab to measure florescence are not portable and cost $30,000," said Sun. "This device essentially takes photographs of the glowing." But researchers also needed a light-tight space to get a good reading on the camera. They considered 3-D-printing a box, but realized that 3-D printers and the materials used in them can be inaccessible, uneven or cost-prohibitive in some parts of the world. 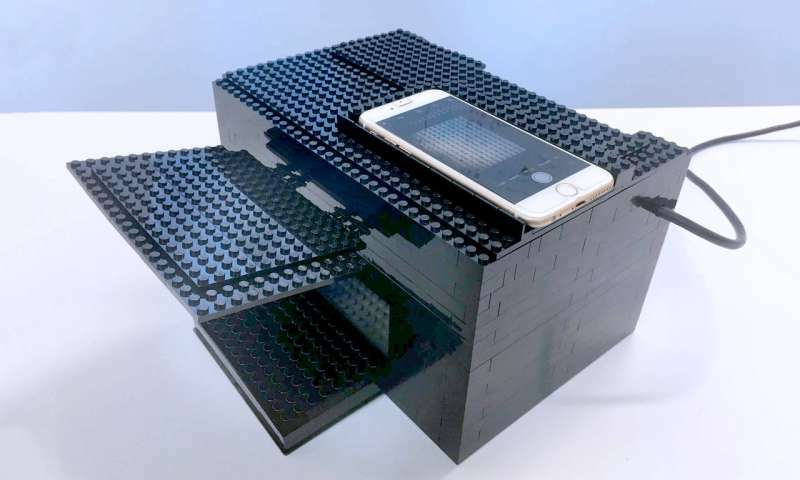 That's when Pedro Metola, a clinical assistant professor at UT, thought of using Legos. "Legos are the same everywhere you go," Metola said.